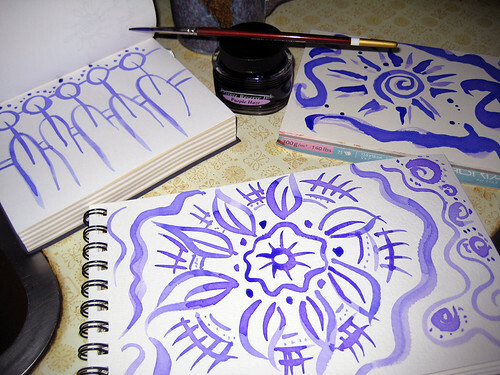 Spiritual Evolution of the Bean: Ever try painting with your fountain pen inks? As most fountain pen inks are water based and non-permanent, it was completely by accident that I found I could do more than simply write and draw with my inks. This piece was done on Fabriano Hot Press Watercolor paper. 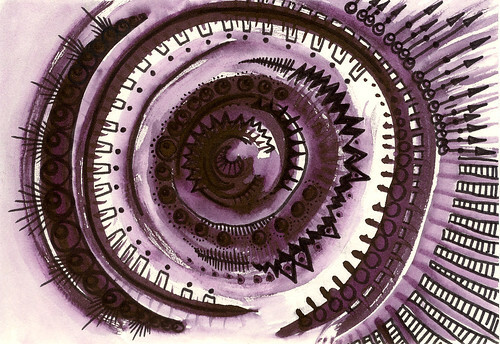 I drew it with a Lamy Safari fountain pen filled with Private Reserve's Burgundy Mist ink. I wanted to add some color around the drawing so grabbed a Niji Waterbrush to paint the border a reddish brown. (Using watercolor paint) Because I wasn't working as carefully as I should have been, I accidentally got some of the ink lines wet, but quickly realized that I could use this to my advantage. All of the pink(ish) color you see was created by running the wet brush against the ink lines. These next pieces were created by dipping a watercolor brush directly into a bottle of Private Reserve's Purple Haze ink then painting with it. I loved the shading that resulted from using the brush. Note: I often have a difficult time re-creating the color purple with my camera and scanner, but I assure you, this is purple. This piece started as the one in the upper right corner of the previous image. I used Fabriano Hot Press Watercolor paper, Private Reserve's Purple Haze ink, a Faber Castell Pitt Artist pen, and Prismacolor colored pencils. Private Reserve's Burgundy Mist ink painted with a brush. For the above image, I filled a Niji Waterbrush with J. Herbin's Rouge Opera ink and then painted with it on Clairefontaine fine art watercolor paper. 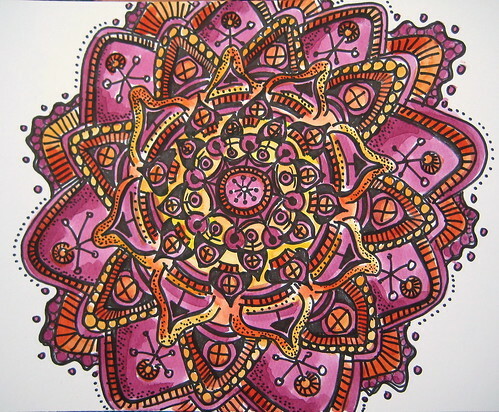 This piece was drawn with a Lamy Safari filled with Diamine's Coral, which is an orangey-pink ink. Washing over with a waterbrush brought out the pink. 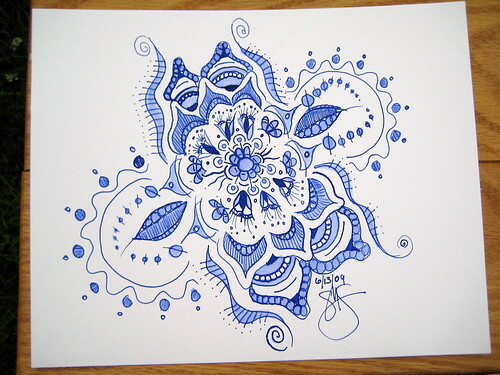 Similar scenario to the above image though I believe this is Diamine's Sapphire Blue. And lastly, this piece was first drawn with a permanent Staedtler Lumocolor marker on thick Clairefontaine fine art paper. I then used the waterbrush filled with Rouge Opera, to fill it in, and some Winsor & Newton pan paints from my Bijou Box to add the yellowish orange sections. I went back over certain parts of the image with the Rouge Opera to add depth and I do believe it builds up nicely. Niji Waterbrush. I buy mine at Blick - though I am aware that similar products exist from other manufacturers. It's basically a paintbrush with a built-in refillable water supply. Beautiful work! This is something I have wondered about, so I am glad to have you have shared this with us. How similar is the performance of the inks to watercolor? Can the colors be blended without getting muddy? Cynthia - thank you for your comments. :o) When I "paint" with a single color, it's similar to watercolor as far as moving the ink around the paper, but I notice that some "shade" more than others, and like in the case of the Rouge Opera, it needed to have several layers built up. I have not tried blending any of the colors in any way - that would be a fun experiment to try. One thing to keep in mind is that you would probably want to transfer the inks to a small WC palette as to not contaminate the inks in the bottle. I always love looking at your work. 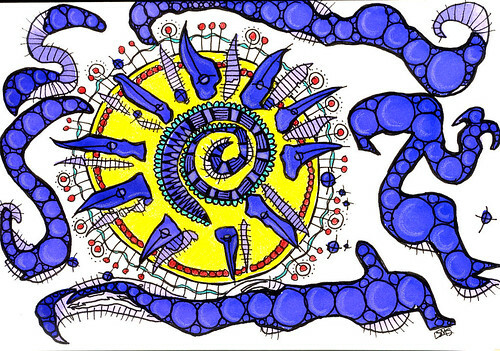 It often inspires me to go off and doodle a bit on my own or at least color in some of a picture in my coloring book. 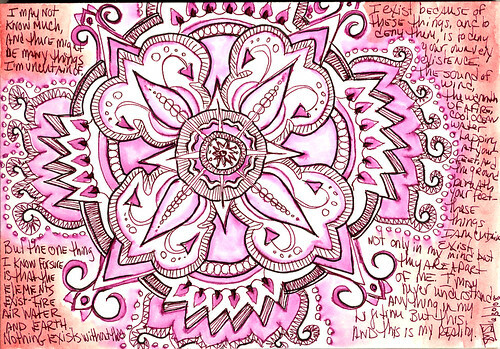 Right now I have been drawing mandalas in my journal. I wouldn't have tried them if I didn't come across you. Now, I'm hooked. And that brush looks intriguing. I may have to mention it to my arty friend of mine. She might enjoy finding one of those and using it because she loves watercolors. Wow. Your drawings are amazing. I love the last one on your post. So cool. 'Watercolouring' with fountain inks totally makes sense! I can imagine a lot of people are reading your post, thinking, why didn't I think of that? Another cool experiment to try, thanks Biffy! First-time commenter, long-time admirer Maika here. Thank you for your WONDERFUL reviews; I use them as a guide for purchasing...well, pretty much everything. Unfortunately, I am not an artist, but I am a professional writer and avid fountain-pen user, so your reviews on inks, papers, and pens are extremely useful to me. I wanted to also suggest, if you have not done so (I haven't seen any), there's an ink that I like, and perhaps you might like to try it? It's meant for calligraphy, but I've found that I can use it in my wide-nibbed fountain pens. It's called "Calli," and I've so far tried the Green 031 (a refreshing, verdant green that is sort of like tree shade in summer...quite a lot of blue to it) and the Blue 011 (just a hint deeper than sky blue and a bit more purple than cornflower blue). I think you might like drawing with them because the chroma level is not too bad (I mean the saturation). They're not what I'd call "fine" inks, but they're nice enough and not too hard on the wallet. They're made by Daler-Rowney, Ltd. in Bracknell, England, but I think they're distributed by Daler-Rowney in Cranbury, NJ, USA. and their Web site is www.daler-rowney.com (according to the ink bottle; I have not gone to their site). They're advertised as "non-clogging, pigmented, waterproof calligraphy ink" and I buy them at my local art store for $4.90 a 1-fl.oz (29.5ml) bottle. If you have not already tried and reviewed them, perhaps you might be interested. I like them a lot. Thank you again for your amazing reviews; I love reading them over and over! Passion, much thanks to your for your kind words! Maika - thank you for taking the time to comment and thank you for your kind words about my blog! I took a look at the "Calli" inks and I myself would be extremely leery of using them in a fountain pen. Typical calligraphy & drawing inks contain shellac which can destroy the feed on your fountain pen. I personally shy away from putting anything in my pens that does not say "for fountain pens." The website says, "Calli is an acrylic based range of pigmented water resistant inks designed specifically for use in calligraphy, where optimum flow characteristics from the pen or brush are essential." May I suggest sending them a note asking them if they are safe for use in a fountain pen? (When they say pen, they could mean dip pen or technical pen...) Thanks again for writing!